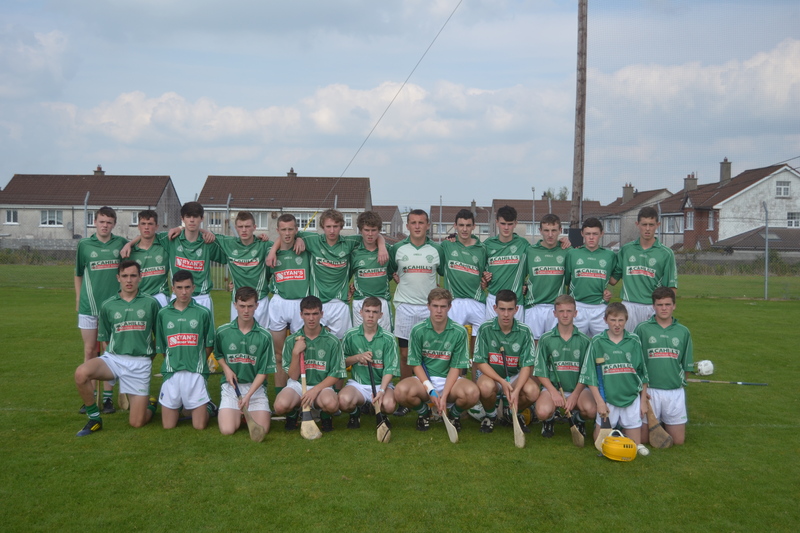 Under 16 Hurling County Final – Saturday 4th October 2014 in Bruff 5:15 p.m. This was a true team performance from a team that has improved with every game played since the start of this campaign. From the first whistle on Saturday, Kilmallock simply had too much hurling for their city opponents and won the key battles in key positions and by doing this snuffed out the Na Piarsaigh challenge. Kilmallock led by 1-7 to 0-5 at half-time with a goal and three points from the outstanding Cal MacCarthy – the goal coming from a determined burst by Cal through the Blues defence followed by an unstoppable shot that threatened to rip the net. Danny Conway, working tirelessly, added another fine point to his tally. Anthony Barrett was inspirational at centre-forward. He scored three points from play in the first thirty minutes and over the hour gave a master-class in how to torture the opposition. The second half, as expected, was a dog-fight as Na Piarsaigh tried everything to gain a foothold in the game. The Kilmallock back-line was terrier-like and limited the fancied city side to just four points in the thirty minutes, three of these coming from placed balls. Jason Enright stopped a bullet as it headed for the net and Na Piarsaigh realised that they were not going to break through today. Ciaran O’Connor, switched from full-forward to midfield at half-time, revelled in the open spaces around the middle of the field and mopped up everything and picked off a great point to cap an excellent display. Three more points from Anthony Barrett in the second half kept the scoreboard ticking over and long before the final whistle it was clear that Kilmallock would be crowned Under 16 County Champions for 2014. Kilmallock : Jason Enright, Liam Fitzgerald, Josh Cahill, Andrew Finn, Aidan Enright, Martin Farrell, David Carroll, Cal McCarthy (1-4), David Woulfe, Danny Conway (0-1), Anthony Barrett (0-6), Liam English, Michael Donegan, Ciaran O’Connor (0-1), Gearoid Barry. Substitutes : Lorcan Casey for Donegan (40 mins), Padraig O’Connor for English (45 mins), Joseph O’Donnell for Barry (50 mins), Jack Barry for Conway (58 mins). Dylan Walsh, David O’Connor, Thomas Savage, Sean Donegan, Dylan O’Brien, Timmy Roche. Management : Donal Barry, Bernie Savage, Jimmy Savage, Pat Barrett, John Woulfe. A brilliant victory for this group of players and management team. a very important victory for Club na nÓg and the club in general. Cill Mocheallóg Abú.